Derek Deprey | What Does ‘Making It’ Look Like for You? 14 Feb What Does ‘Making It’ Look Like for You? What did ‘making it’ look like for you as a kid? For me, I wanted to be the next Michael Jackson. I mean, I had the Thriller album 8-track and cassette tapes. 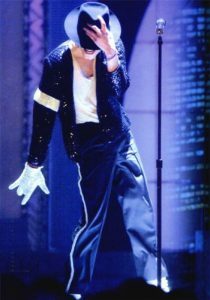 I wore Michael’s white jacket from Thriller, his red jacket from Beat It, and his diamond glove from Billie Jean. My obsession didn’t stop there. I had my nanny, Pam, curl and style my hair… only to be so embarrassed after looking in the mirror that I wore my winter hat the rest of that hot summer day. Thankfully, after my mom came home from work that evening, we shampooed my hair back to normal … the mullet. 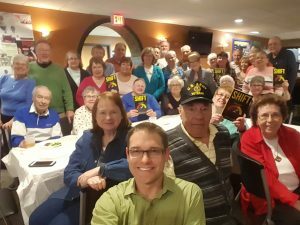 Two years ago, my friend Pat asked me to speak at a leadership “Lunch and Learn” for a group of senior citizens. For the next 12 months, I kept putting it off because I was “ too busy.” Eventually, about 18 months after the initial request, I committed. During my presentation, I kept thinking to myself, “I didn’t put this off for over a year because I was too busy. Instead, I delayed because I didn’t think I had anything new to teach this clearly successful group of people.” Thankfully, I finally followed through and we had an absolute blast. Success or ‘making it’ is officially defined as the accomplishment of a purpose. In other words, you get to decide what purpose to accomplish! What does success look like for you as an adult? I’m guessing that it’s different from when you were younger.. It sure is for me! When I was a kid, success for me would have been to be just like Michael Jackson. As an adult, success to me is to live my ideal life right now. When I reflect now on what my current definition of success is, I spent hours reflecting on and evaluating my life and where I want it to go. What does success mean to you? Be honest with yourself and try not to worry about what other people want for their lives. What Does ‘Making It’ Look Like to the Average American? Because I didn’t want to color your opinions, I have purposely put what ‘making it’ looks like to the average American after you have had an opportunity for self-reflection. According to a ThermoSoft poll of over 2,000 adults, ‘making it’ means being married, enjoying two kids, spending time with four best friends, earning $147,000 per year, working 31 hours per week, commuting to work in 10 minutes, having flexibility to work at home, enjoying over 5 weeks of vacation, traveling 3 times per year, buying a home for $461,000, and purchasing a car for $41,000. While success doesn’t have a one-size-fits-all definition, people seem to want the same general thing… more, more, more. It’s easy to get caught up in the chase. If you don’t carefully define what success means to you, you’ll never make it… because you’ll end up going after someone else’s hand-me-down version of what success looks like. Think about your legacy. If you were at the end of your life, what would you want others to remember about you? I prefer a broad view of success because an objective accomplishment can fail to translate into subjective satisfaction. Think about it. Have you ever been “successful” and, after accomplishing that success, still felt empty? Again, my definition of success is to live my ideal life right now. My broad, legacy definition helps me to make specific, day-to-day, week-to-week, month-to-month, and year-to-year decisions. Last fall when I was raking leaves, I ran into my friend and neighbor, Rick. We took a break to talk about work and life. I mentioned that Rachel and I were thinking about moving into a different home and neighborhood in the near future. At that moment, Rick commented, “We’ve lived in the same house for about 25 years and have definitely thought about moving, but bigger and newer doesn’t mean that it will improve the quality of the life that we have right now. Quality of life is huge.” What a practical way to look at life’s decisions. His statement certainly gave us food for thought. Quality of life describes the overall enjoyment of life. How does your quality of life rate? How good is your health, relationship, education, career, and bottom line? While you consider what “making it” means to you, ask yourself the following question when deciding: Will this next move I’m contemplating improve my quality of life? Let this question be your filter! Ask this question of every difficult decision, such as who to connect with, what to eat, why to exercise, where to work, and when to buy a new car or home. My childhood friend, Stacey, recently posted this powerful message on Facebook. Earlier in my career, I remember going to my boss’s office to get checks signed. He asked me, ‘What are your plans? Do you want to just deliver checks for the rest of your life, or do you want to be the person who signs the checks?’ I was insulted. I know a lot of people who ‘sign the checks,’ and that’s ok. They chose their path and I chose mine. My point is this: if you’re the mail clerk, maintenance technician, CEO, janitor, police officer, nurse, stay at home mom or dad, or plumber, great! Do what you like. Be who you love. Work hard. Do a good job. And leave the rest to someone else who loves it. Can you relate to this post in your own life? Don’t be so hard on yourself. Chances are, you’ve already made it, as defined by your own values. ACTION: Reflect upon the following questions: What does ‘making it’ look like for YOU? And, will this improve your quality of life?